The only constant thing in this world is change. (http://vinodtbidwaik.blogspot.in/search/label/Change%20Management) We can’t expect growth by working the same way, we worked yesterday. Organizations need to change as per the situation. World changes and hence you are forced to change. Change can be related to culture, your product line, new technology, organizational restructuring or any new programme. Let’s call this as a Change Programme. 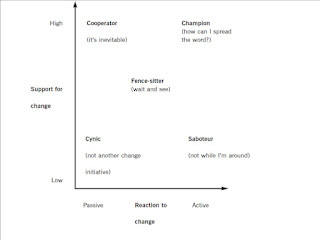 The Change Progrmame has high impact on all stakeholders positively or negatively, including your employees. Your Change Programme and employee engagement has direct relation. 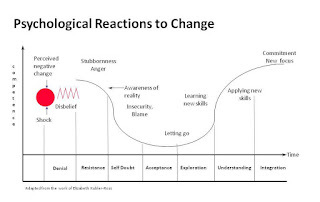 Various individuals and groups within a business react to change in different ways. 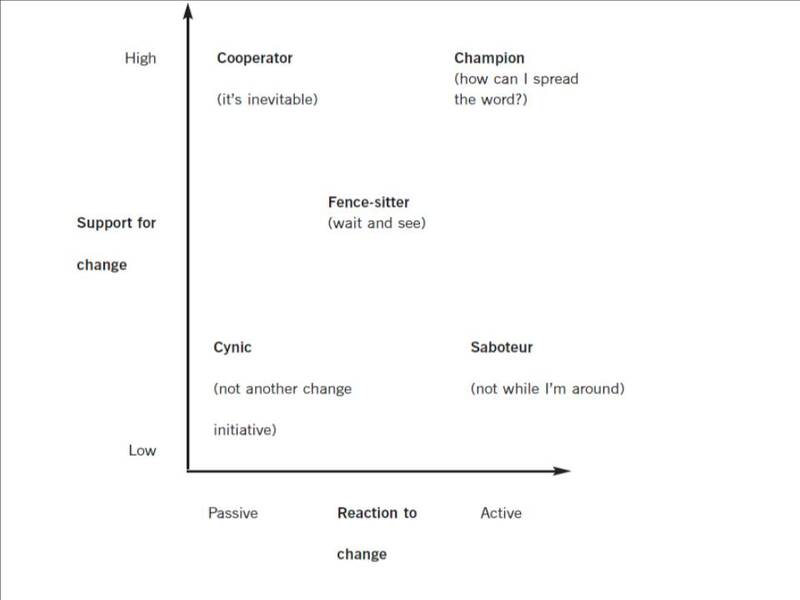 Individuals react differently depending on the nature and context of the change. Therefore it is very important how you communicate and engage employees in change programme. Employee may be fearful while considering the change. It is very important how you salvage the negative impact if any. Normally if the change is not communicated properly and righty, employee engagement goes down and you may face denial issues. Most of the exits are during change process. Typically you will see the reaction as per the figure mentioned below. At every stage, the communication is vital. You will also the different people who will have different reaction on the change. There will be passive people, there will be active people. Their support will be variable as per their drive and past experience. Change communication must therefore tackle each group, both individually and as part of the overall mix. I believe that the challenge is to recognize all these groups and manage the shifting relationships between them. It’s all about understanding people’s motivations. For example, ‘saboteurs’ are usually demotivated for very clear reasons. Perhaps they resent not being involved, can’t see what’s in it for them or feel that it’s challenging their role or their identity in the workplace. 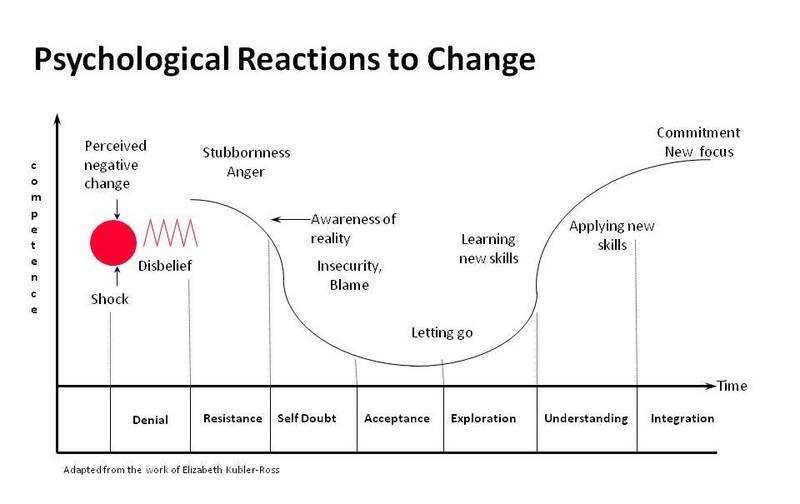 It follows, therefore, that change communication needs to address these and other negative reactions by helping people understand how they can gain from the change. Just be honest in communication and find out the innovative ways of communication. Do the proper branding. Identfy openionmakers. Openionmakers are senior employees, former union officer berarers and people who are influencial in the organization without any authority. Use these openionmakers for proper communication. Plan informal communication with them first to guage the reaction. Second important job is identifying troublemnakers. Troublemakers are everywhere in the organization. Have the informal discussion with them and put the story in a positive way. If you have a proper strategy for implementing “Change Programme” and you have positive story for them, your employees will fully support you.